Schneider, Rudolph. "Formspiel durch Kino," Frankfurter Zeitung 12 July 1926. Böhme, Fritz. "Der Tanz der Linien." Deutsche Allgemeine Zeitung 16 Aug. 1930. Behm, Walther. "Abstrakte Filmstudie Nr. 5 von Oskar Fischinger (Synästhetischer Film)." Farbe-Ton-Forschungen, ed. Georg Anschütz. Vol. III. Hamburg: Meissner, 1931: 367-369. Diebold, Bernhard. "Über Fischingerfilme: das ästhetische Wunder." Lichtbildbühne 1 June 1932. Bohme, Fritz. "Tönende Ornamente: Aus Oskar Fischingers neuer Arbeit." Film-Kurier 30 July 1932. Knight, Arthur. "The Small Screen." Theatre Arts 31.5 (May 1947): 1, 9-10. Fischinger, Oskar. "My Statements are in My Work." in Art in Cinema, Frank Stauffacher, ed. San Francisco: Art in Cinema Society-San Francisco Museum of Art, 1947: 38-40. Reprint New York: Arno Press, 1968. Online at CVM Fischinger site. Manvell, Roger ed. Experiment in the Film. London: Grey Walls Press, 1949. 131, 140, 198, 229-230, 233. Fischinger, Oskar. "A Statement About Painting" for Frank Perls Gallery brochure. 1951. Cotta, Ty. "Oskar Fischinger: Abstract Movie Master." Modern Photography Vol 16:7 (July 1952), 74-75, 82, 84. Millier, Arthur. "Fischinger Still Paintings on Exhibit at Pasadena." Los Angeles Times 30 Dec. 1956. Renan, Sheldon. An Introduction to The American Underground Film. New York: Dutton, 1967. 51, 59, 79, 81-82, 93-95, 116. Weaver, Mike. "The Concrete Films of Oskar Fischinger." Art And Artists 4.2 (1969): 30-33. Long Beach Museum of Art. Bildmusik: Art of Oskar Fischinger. Long Beach, CA, 1970. Curtis, David. Experimental Cinema. London: Studio Vista, 1971. 30, 53-61, 131, 134. Starr, Cecile. Discovering the Movies: An Illustrated Introduction to the Motion Picture. New York: Van Nostrand Reinhold Co., 1972. Moritz, William. "The Films of Oskar Fischinger." Film Culture 58-60 (1974): 37-188. Martin, André. "Pourquoi il Faut Voir, Revoir et Revoir Encore les Films de Oskar Fischinger." Ottawa '76 International Animated Film Festival. Cinémathèque Québecoise, 1976. Moritz, William. "The Importance of Being Fischinger." Ottawa '76 International Animated Film Festival. Cinémathèque Québecoise, 1976. online at CVM Library. Russett, Robert and Cecile Starr. Experimental Animation. New York: Van Nostrand Reinhold Co., 1976. Rev. ed. New York: Da Capo Press, 1988. Moritz, William. Fischinger at Disney - or Oskar in the Mousetrap. Millimeter. 5. 2 (1977): 25-28, 65-67. Hein, Birgit, and Wulf Herzogenrath, eds. Film Als Film, 1910 Bis Heute. Kölnischer Kunstverein, 1978: pp. 74-78. Rosenblum, Gordon. Oskar Fischinger, 1900 - 1967. Fischinger, a Retrospective of Paintings and Films. Curators Gerald Nordland and Gordon Rosenblum. Denver, CO: Gallery 609, 1980. Fischinger, Elfriede. "Writing Light" in Fischinger: A Retrospective of Paintings and Films exhibition catalog (Denver, CO: Gallery 609, 1980). Reprinted in The Relay. 3.2 (May 1984): 4-7. Reprinted in First Light, Robert A. Haller, ed. New York: Anthology Film Archives, 1998: 30-34. online at CVM Library. Moritz, William. "You Can't Get Then from Now." (Part I). Los Angeles Institute of Contemporary Arts Journal 29 (1981): 26-40, 70-72. online at the CVM Library. Rigby, Ida Katherine. "Oskar Fischinger (1900-1967)," in The Milton Wichner Collection (exhibition catalog). Long Beach: Long Beach Museum of Art, 1981. Bohn, Richard. "Visual Music Pioneer: Oskar Fischinger" in The Relay. Reseda: Visual Music Alliance (October1982), p. 3. Canemaker, John. "The Abstract Films of Oskar Fischinger." Print Magazine 37.2 (March/April 1983): 66-72. Moritz, William. "Towards a Visual Music." Cantrills Filmnotes 47-48 (1985): 35-42. Beauvais, Yann, Dusimbere, Deke, (sous la dir. de), Musique Film, Scratch / Cinémathèque Française, Paris, May 1986. Stockbridge, Sally. `Intertextuality: Video Music Clips and Historical Film'. In T. O'Regan & B. Shoesmith eds. History on/and/in Film. Perth: History & Film Association of Australia, 1987. Bendazzi, Giannalberto. Cartoons: Il cinema d'animazione, 1888-1988. Venice: Marsilio Editori, 1988. English edition: Cartoons: One Hundred Years of Cinema Animation. Trans. Anna Tarabolettti-Segre. London: John Libbey & Company Ltd., 1994. Moritz, William. The Private World of Oskar Fischinger. Liner Notes,"The World of Oskar Fischinger" laserdisc, LaserDisc Corporation, Tokyo, 1988. Peacock, Kenneth. "Instruments to perform color-music: Two centuries of technological experimentation," Leonardo, 21 (1988). Ehrlich, Susan. "Oskar Fischinger." Turning The Tide: Early Los Angeles Modernists, 1920-1956. Santa Barbara Museum of Art, 1990. 63-67. Moritz, William. "Film Censorship During the Nazi Era." Degenerate Art: The Fate of The Avant-Garde in Nazi Germany. New York: Abrams, 1991: 184-191. German edition: Entartete Kunst: Das Schicksal Der Avantgarde Im Nazi-Deutschland. Munich: Hirmer, 1992: 184-191. Lorenz, Marianne. "Oskar Fischinger." Theme And Improvisation: Kandinsky and The American Avant-Garde. Dayton Art Institute, 1992: 159-162. Mattis, Olivia. Varese's Multimedia Conception of "Deserts." The Musical Quarterly, Vol. 76, no 4 (Winter, 1992). On JSTOR. Moritz, William. "Oskar Fischinger: artiste de ce siècle." L'armateur 12 (1994): 29-33. Moritz, William. "Musique de la Couleur - Cinéma Intégral." in Poétique de la Couleur. Paris: Musée du Louvre, 1995. English version online at CVM Library. Cantrill, Arthur. La couleur au cinéma - Poétique de la couleur (Review) in Cantrills Filmnotes No. 79/80, Nov. 1995. Smith, Harry. "Oskar Fischinger." Articulated Light: The Emergence of Abstract Film in America. Gerald O'Grady and Bruce Posner, Eds. Boston: Harvard Film Archives, 1995: 9. Moritz, William. "Gasparcolor: Perfect Hues for Animation." Animation Journal 5. Maureen Furniss, Ed. (1996): 52-57. ONLINE at CVM Fischinger pages. Brinckmann, Christine Noll. Collective Movements and Solitary Thrusts: German Experimental Film 1920-1990. Millenium Film Journal 30/31, Fall 1997. Knight, Christopher. "First Class Study of Fischinger's Impact." Los Angeles Times 2 May 1998: F1. Allan, Robin. Walt Disney and Europe: European influences on the animated feature films of Walt Disney. Indiana University Press, 1999. Culhane, John. Fantasia 2000: Visions of Hope. Disney Editions, 1999. Moritz, William. "Oskar Fischinger, artista del secolo, Gli anni americani." Cinegrafie 13 (2000): 112-117 (Italian). In English: 278-282. Barron, Stephanie, Sheri Bernstein, and Ilene Susan Fort, eds. Reading California - Art, Image, and Identity, 1900-2000. Los Angeles: University of California Press, 2000: 44, 49 n. 40. Levin, Golan. Painterly Interfaces for Audiovisual Performance. Thesis, Massachusetts Institute of Technology, 2000..
MacDonald, Scott. Cinema 16: Documents Toward a History of the Film Society. Philadelphia: Temple University Press, 2002. Galard, J., ed. et al, L'Oeuvre d'Art Totale. Paris: Gallimard and Musée du Louvre, 110, 123-131, 133-137. Duplaix, Sophie and Marcella Lista, eds. Sons & Lumieres: Une histoire du son dans l'art du XXe siecle. Paris: Editions du Centre Pompidou, 2004. Klein, Norman M. The Vatican to Vegas: The History of Special Effects. New Press, 2004. Kimmelman, Michael. "With Music for the Eye and Colors for the Ear," New York Times, July 1, 2005. Gopnik, Blake. "Music to Your Eyes," Washington Post, June 23, 2005 (review of Hirshhorn Visual Mudic exhibition). James, David. The Most Typical Avant-Garde: History and Geography of Minor Cinemas in Los Angeles. Berkeley: University of California Press, 2005. Levin, Thomas Y. "Tones from Out of Nowhere": Rudolph Pfenninger and the Archaeology of Synthetic Sound. New Media, Old Media: A History and Theory Reader. Wendy Hui Chun, Thomas W. Keenan, eds. New York: Routledge, 2005. Keefer, Cindy. "Space Light Art": Early Abstract Cinema and Multimedia, 1900-1959". White Noise. Ernest Edmonds and Mike Stubbs, eds. Melbourne: ACMI, 2005. 21-28, 30-31, 33. ex.cat. Online version contains minor edits, 2008. Cox, Christoph. "Lost in Translation: Christoph Cox on Sound in the Discourse of Synesthesia." Artforum, October 2005. Jewanski, Jörg and Natalia Sidler, Eds. Farbe - Licht - Musik: Synästhesie und Farblichtmusik. Bern: Peter Lang, 2006. (Part of the series, Zurcher Musikstudien Band 5). MacDonald, Scott, ed. Art in Cinema: Documents Toward a History of the Film Society. Temple University Press, 2006. Deisl, Heinrich. Absolute Bilderwelten. Ray Filmmagazin, September 2007. Vienna. van Campen, Cretien. The Hidden Sense: Synesthesia in Art and Science. MIT Press (Leonardo Books), 2007. Draganski, Donald. "Paul Hindemith Meets Walt Disney." Essay on Michael Barrier's blog, posted Feb 16, 2007. Wahl, Jan. Through a Lens Darkly. BearManor Media, 2008. Keefer, Cindy. "Cosmic Cinema and The Vortex Concerts." in Cosmos: The Search for the Origins, from Kupka to Kubrick. Arnauld Pierre, Ed. Madrid:El Umbral/Santa Cruz de Tenerife:TEA, 2008. Exhibition catalog. Karole Vail, ed. The Museum of Non-Objective Painting: Hilla Rebay and The Origins of the Solomon R. Guggenheim Museum.. New York: Solomon R. Guggenheim Museum, 2009. Bock, Hans-Michael and Tim Bergfelder, eds. The Concise Cinegraph: encyclopaedia of German cinema. Oxford UK and New York: Berghahn Books, 2009. Rainer, Cosima et al. See This Sound: Promises in Sound and Vision. Lentos Kunstmuseum, Linz and Walter Koenig, Koln, 2009. Exhibition catalog. Keefer, Cindy. 'Raumlichtmusik' - Early 20th Century Abstract Cinema Immersive Environments Leonardo Electronic Almanac Vol 16, no.6-7 . Leonardo, Journal of the International Society for the Arts, Sciences and Technology. October 2009. PDF. Melchior, Ib. Six Cult Films from The Sixties. BearManor Media, 2009. See chapter on Time Travelers (re The Lumigraph). Daniels, Dieter and Sandra Naumann, eds. Audiovisuology Compendium. Koln: Walther Koenig, 2010. Keefer, Cindy. Jordan Belson, Cosmic Cinema and the San Francisco Museum of Art. SF MoMA Open Space, Blog post October 2010. Hilty, Greg and Alona Pardo, eds. Watch Me Move: The Animation Show. London and New York: Merrell, 2011. Published in association with The Barbican Art Gallery. Beard, Thomas, Ed. The Unfinished Film. New York: Gladstone Gallery, 2011 (Fischinger's "Sounding Ornaments" text is reprinted here). Satz, Aura. Shapes with the Sound of their own Making. Cabinet magazine, Issue 44 (Winter 2011/12). Brown, Richard H.. “‘The Spirit Inside Each Object’: John Cage, Oskar Fischinger, and ‘The Future of Music.’” The Journal of the Society of American Music. Vol. 6, no. 1, February 2012. Keefer, Cindy. Oskar Fischinger and California Abstract Animation. Los Angeles County Museum of Art, UNFRAMED. April 28, 2012. Kiening, Christian and Heinrich Adolf, eds. Der absolute Film. Dokumente der Medienavantgarde (1912-1936). Zurich: Chronos, 2012. Johnson, Ken. "The Lines and Shapes of a Mystical Stenography: Signs and Symbols and Oskar Fischinger at The Whitney Museum," New York Times, July 26, 2012 (online), July 27, 2012 (print). Buchan, Suzanne. "Three's Company." Artforum.com. September 25, 2012 (on Raumlichtkunst). Meade, Fionne. "Oskar Fischinger, True West", in SPIKE Art Quarterly, Vienna, Austria. Autumn 2012 (on Raumlichtkunst). Diehl, Carol. "Oskar Fischinger, New York, Whitney Museum." in Art in America. November, 2012 (on Raumlichtkunst). Keefer, Cindy and J. Guldemond, eds. 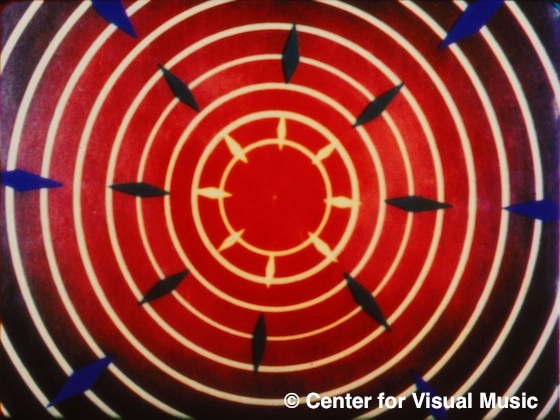 Oskar Fischinger (1900-1967): Experiments in Cinematic Abstraction. Amsterdam and Los Angeles: EYE Filmmuseum and Center for Visual Music, 2013. Distributed by Thames & Hudson. Monograph with texts by Keefer and international art historians, musicologists and film historians. Peterson, Jennifer Lynn. Education in the School of Dreams. Duke University Press, 2013. Frederick, Samuel. Cinematic Collecting: The Continuous Discontinuity of the Still Frame in Oskar Fischinger's Walking from Munich to Berlin. in animation: an Interdisciplinary Journal, Suzanne Buchan, ed. Sage Journals, Vol 8, no 3, November 2013. Ivey, Paul Eli. "Enchanted Modernities: Mysticism, Landscape, and the American West." The Senses and Society, 10:1, 92-98, 2015. Mollaghan, Aimee. The Visual Music Film. Palgrave, 2015. Keefer, Cindy. "Visual Music's Influence on Contemporary Abstraction" in Gabrielle Jennings, ed., Abstract Video, The Moving Image in Contemporary Art. UC Press, 2015. Book Chapter. Diebold, Bernhard and Richard George Elliott. "The Future of Mickey Mouse (The Animated Film as a New Cinema Art)." Art in Translation, Vol 8, no 1. Smith, Roberta. "Diving into Movie Palaces of the Mind at the Whitney." New York Times, Dec 1, 2016. "...the great Oskar Fischinger"
Barcio, Phillip. The Mesmerizing Animations of Oskar Fischinger. Ideel Art (online), 2017. Keefer, Cindy.Raumlichtkunst - Fischinger and Abstract Cinema Immersive Environments. Exhibition Brochure, Weinstein Gallery, San Fraancisco, December, 2017. Canemaker, John. Oskar Fischinger: Visual Music (DVD Review). Animated Eye Blog, February 12, 2018. Text and images on these pages are protected by Copyright law (Title 17 U.S. Code). Please seek permission before reproducing any of this bibliography. You may not reprint, distribute or reproduce this bibliography without the written permission of and proper credit to Center for Visual Music. An extensive bibliography including many early German texts, to the year 2004, can be found in William Moritz's Fischinger biography Optical Poetry (2004).